Prezi can be another tool in your skill set for making presentations. Instead of preparing PowerPoint slides and moving from one to the next, Prezi uses one large canvas with zooming from place to place as the presentation progresses. 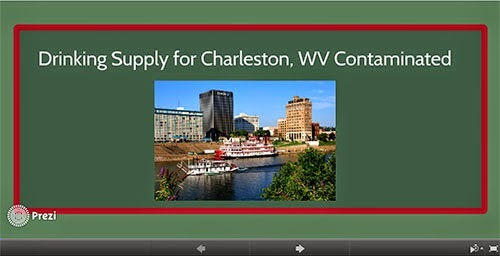 YouTube videos can be integrated into the presentation. Prezi is free and accessible from the internet at prezi.com. The following link is to a presentation I prepared for a recent Public Relations class. The topic is the January 2014 chemical spill in West Virginia's Elk River. You can step through the presentation by clicking on the arrows at the bottom of the Prezi screen. Three YouTube videos are incorporated into this presentation. It will take 10-20 minutes to view. The following is a minute-long YouTube video about Prezi. I used Prezi on both Windows 7 and Windows 8 computers. I was unsuccessful in downloading the iPad app. If you try out Prezi for the first time, please leave a comment about your experience.